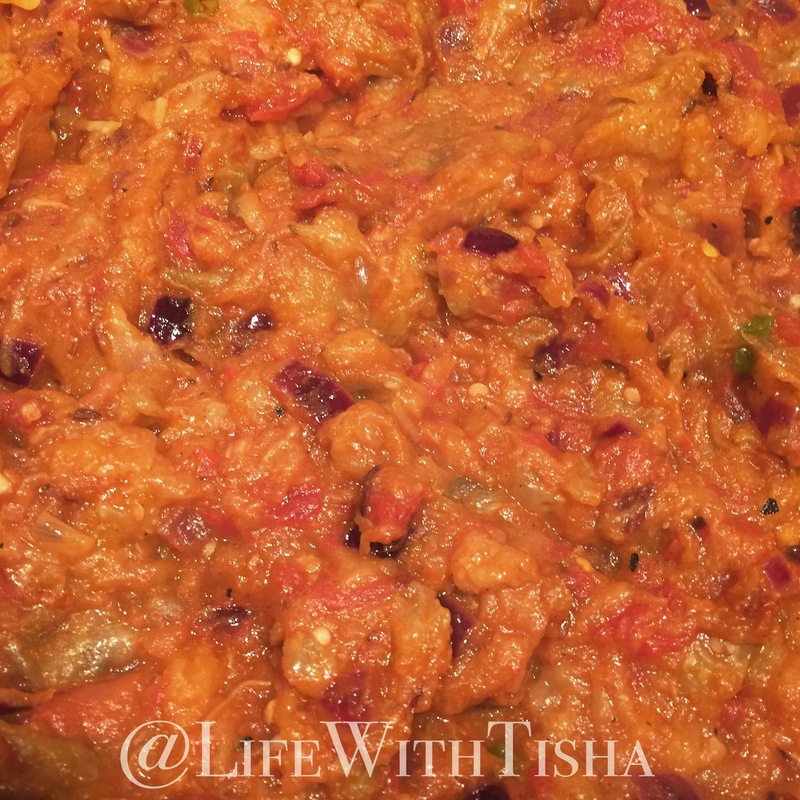 Today, I have another recipe for the vegetable that goes by many names: eggplant, aubergine, brinjal. This purple vegetable is extremely versatile and cooked by many different cultures. I quite enjoy eating the Punjabi version, and decided to make it at home for the family for a quick and healthy meal. The recipe is very easy, and takes about 30 minutes to cook. With only 5 minutes needed for prep, this is a healthy, simple, flavourful dish that anyone can make. Find the original recipe on Tarla Dalal’s website. Wash and dry the eggplant. Cover with oil and roast on an open flame until it is cooked. I use the open flame on my gas stove top. This usually takes anywhere from 8-13 minutes. Keep rotating so that it cooks evenly. When it starts really smoking, it’s well cooked. Peel the skin and discard. Mash up the eggplant and set aside. You can use a fork or potato masher. In a shallow pan, heat up the ghee and add cumin seeds. When the seeds begin to crackle, add the onions and sauté until they become translucent and start to brown a bit. Add the ginger, garlic and chillies and continue to sauté for a few more seconds. Be careful, as the aromatics tend to burn quickly, especially if the heat is too high. Add the chopped tomatoes, turmeric powder, coriander powder, cumin powder, curry powder and salt. Cook until oil starts to seep out. Add the mashed up eggplant and cook for another 3-4 minutes. Garnish with optional fresh coriander and serve with rice or paratha. I hope you guys enjoyed this simple but fresh and tasty recipe! Definitely try making it – Tarlal Dalal knows what she’s talking about. Happy eats, everyone! I am trying it tonight,thanks for the recipe.